The battle for first place came down to two little points. 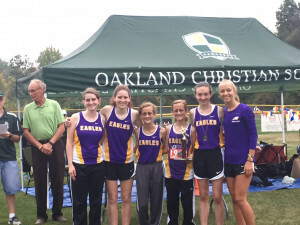 When the team awards were announced at the end of the Oakland Christian Small School Invite, it was down to two schools: Waterford Lady of the Lakes and PCA. WOLL had the first place runner and they had just edged PCA the previous Saturday at the Holly Invite. So there was a collective gasp when the announcer said that the winner of the Women’s Small School Invite was Plymouth Christian Academy! How did PCA pull off the victory? So many factors! Was it Sienna Ruiter, battling illness, gutting out a top five finish? Was it Emily Cameron, also finishing in the top five? Or how about Nicole Reinhart, who, after tripping on the gravel path face first, scrambled to her feet with her arms bruised and bloodied, face covered in mud, and recovered to a 6th place finish overall? Perhaps it was Eva Warmbier, Sarah Reinhart, Joy Chamberlain and Ella Godin’s impressive performances? The answer is all of the above! On the men’s side, the first place finish had a little more breathing room but was equally impressive with Luke Pohl and Seth Windle once again finishing first and second respectively. Hunter Torolski, Quinn McLaren and Nathan Sutrick all finished in the top 20. Caleb Godin and Eric Moore also ran very well for the Eagles. 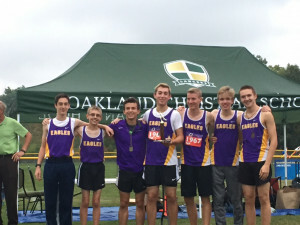 The Eagles will race again on Saturday afternoon at the Jackson Invite in Jackson, Michigan.